Citrus fruits are my favorites when the weather gets colder and the holiday season is around the corner. I always relate the fresh smell of a peeled citrus fruit with the joy of the winter season and Christmas time. A centerpiece of citrus fruits brings a natural and a bright pop of color to simple table settings. You can have it on the table while you serve the meal courses or, if you don’t have enough room, you can put it away and bring it back when it’s dessert time. Even though your intention is not to serve fruits as a dessert, it is polite to have it on the table just in case one of your guests will want to eat a fruit. Mind you, there are people of different cultural background and they may eat fruits before a meal. 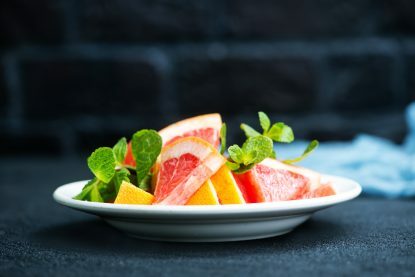 Fresh citrus fruits are usually served on glass plates or bawl. Still, for special events or festive dinners, white plain ceramic plates make a better option, enhancing the distinctive occasion. Have for each person a dessert plate with a bowl followed by a fork, a knife, and a dessert size spoon. 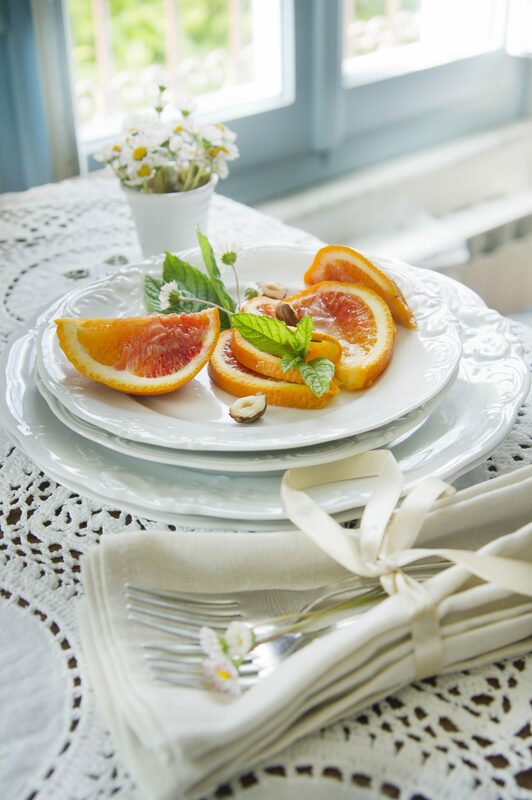 If you intend to serve the citrus fruits with cookies than have a separate plate with cookies and place it on the table. Do not mix the fruits with biscuits on the same plate. Maybe some people will want to eat only fruits or only cookies and they don’t like to mix them on the same plate. 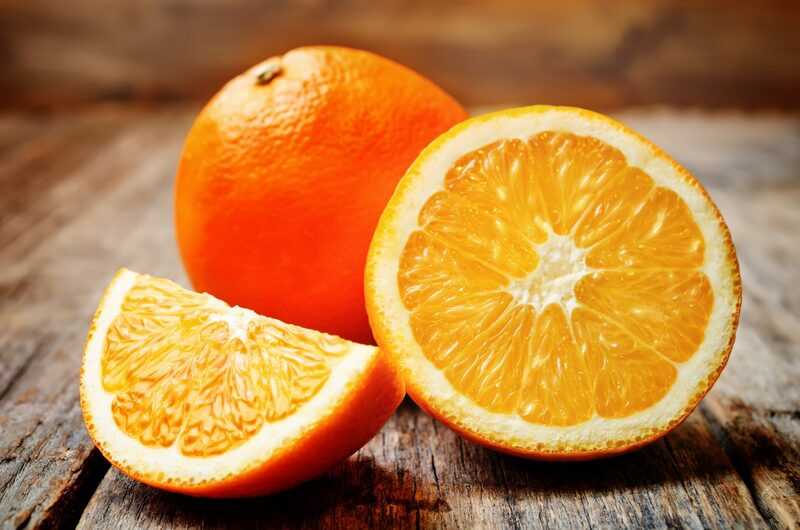 Citrus fruits pair very well with nuts especially almonds, chocolate, and coffee. The strong citrus flavor easily complements and enhances spicy seasonings such as nutmeg and cinnamon, fresh herbs like basil and mint. The seasonings go well with stewed or baked citrus fruits, or fresh fruit compotes. The herbs are a perfect addition to the fresh fruits delighting the appetite. There are two ways to eat an orange gracefully. First, cut the whole orange in half, take out the seeds and eat the fruit from the skin with a spoon. If a seed gets in your mouth then don’t panic, remove the seeds with the tip of the spoon and take out the seeds from the mouth with the spoon and leave them on the side of the plate. Second, using the knife to slit the skin of the orange in quarters and peel back gently detaching the skin from the fruit. The orange should look like a flower in bloom. 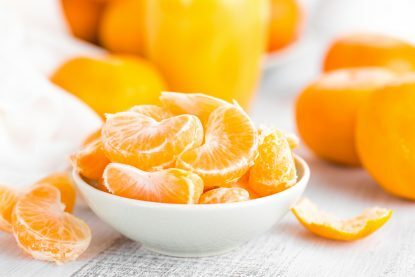 You can use your fingers to open the orange in separate slices and bite small pieces from the orange slice. Remove the seeds from your mouth with your fingertips and lay them on a paper napkin or on the side of the plate. The rule of thumb: take out the seeds from your mouth with the same tool that you put in your mouth. If you use a spoon to eat a fruit than with the same tool take the seeds out if you use your fingers then use your fingertips to take out the seeds. Grapefruit is a tricky fruit that requires more preparation before being served to delight the appetite. 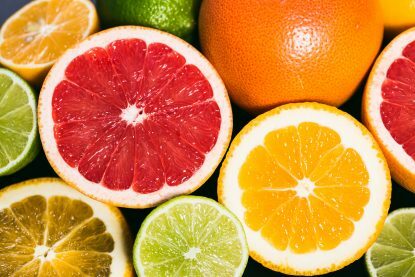 The grapefruit is the only citrus that should be peeled and cut before serving. Peel the skin, cut the slices free from the rind and separate them from the white membrane, and serve them in a glass bowl. Make sure you don’t pierce the rind, so the juice won’t leak on the plate. Give your guests an option and cut a grapefruit in half and serve on a dessert plate. Make sure they have a spoon and a knife next to their plates. Accompany serving the grapefruit with sugar or honey, sherry or liquor, in separate bowls for your guests to have a variety of options. Tangerines and mandarins are the best choices for a fruit dessert. Their thin skin can easily be broken and pulled back. Peel and pull back the skin and with your fingers brake off one slice at a time and eat the slice. Usually, the slices are small, and you can eat it from a single bite. But if the slice is the same size as your finger than eat the slice in two bites from the fingers.